Mar 21, 2004 — Some 800 years after his death, Moses Maimonides remains one of Judaism’s most enduring icons. And according to scholars attending a conference sponsored by Yeshiva University and New York University, his works remain relevant in addressing today’s moral and ethical challenges, including the causes and treatments for common depression. “Maimonides realized the soul becomes weary and the mind dull by continuous reflections upon abstruse matters, just as the body becomes exhausted from undertaking difficult labors until it rests and returns to its equilibrium,” said Joel Kraemer, a University of Chicago professor of near eastern languages. 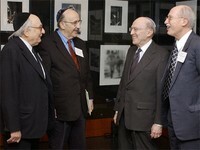 Prof. Kraemer delivered the keynote address Sunday evening at the Center for Jewish History, home to the YU Museum. The March 21 gathering, Moses Maimonides: Talmudist, Philosopher, and Physician, commemorates the 800th anniversary of the death of the 12th century sage (1135-1204), known in rabbinical literature as “Rambam” from the acronym Rabbi Moses Ben Maimon. Considered the greatest single figure in medieval Judaism in both philosophical and halakhic scholarship, Maimonides, said Prof. Kraemer, devoted his life to serving both his fellow Jews and the community at large, solidifying a central tenet of Jewish practice. He achieved both while living in Egypt, where he and his family found sanctuary after their forced departure from Spain. Early on, Maimonides established his intellectual mettle as a rabbinic authority, codifier, Aristotelian philosopher, and royal physician. Prof. Kraemer said Maimonides’s vast intellectual powers found expression in his determination to create orderly and rational rhythms in everyday life. Before age 16, he completed his Millot HaHigayon (Treatise on Logic). Then, in 1158, he followed with his astronomical Maamar HaIbbur (Treatise on the Calendar). At 22, he completed his first major work, his Perush HaMishna (Commentary on the Mishna), which covered animals, plants, flowers, and natural history, as well as human psychology. It was in Egypt that he turned to codifying Talmudic law, the Mishneh Torah (the Torah Reviewed), his 14-volume compilation of Halakhah. In his remarks, Prof. Kraemer focused on Maimonides’s most famous and remarkable work, his three-book Moreh Nevuchim (Guide for the Perplexed), in which the sage explains Jewish theology and philosophy. He said Maimonides took his medical career seriously and gained fame from his care for non-Jews, including Saladin’s vizier, Al-Fadi al-Baisami, from whom he received a salary. According to Prof. Kraemer, Maimonides wrote extensively on diet, drugs, and treatment, while he lectured on physiology and therapeutics, as well as Jewish religion and law.